We are officially in November and only seven weeks away from Christmas. Seven weeks! Can you believe it?!? I don’t know about you, but time seems to go much faster for me once the busyness of the holiday seasons hits. That means those seven weeks are going to be up before we know it. If you’ve yet to save anything for Christmas, you still have plenty of time to earn some Christmas spending money. Whether you're trying to avoid more debt, save and earn to buy something bigger than usual, or do something unexpected for your family, now's the time to get to work! 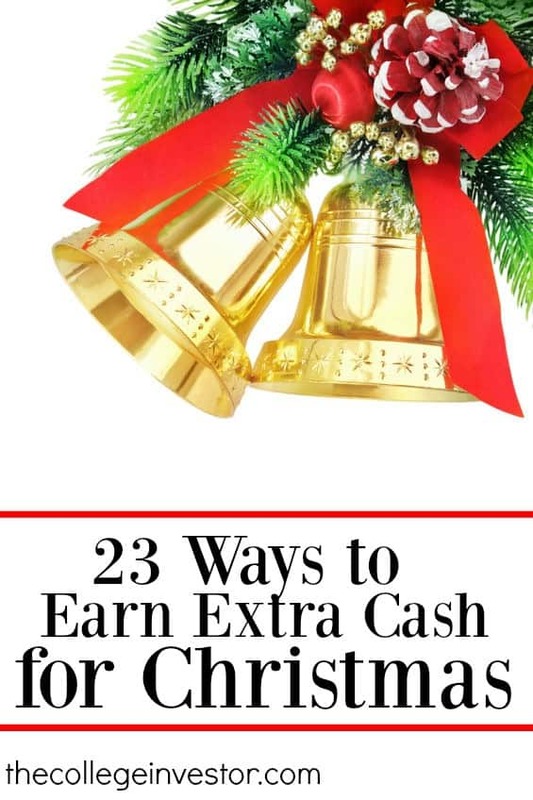 Here are 23 ways to earn extra cash for Christmas this year so that you can have the holiday season you want, not just the one you see on Instagram. If you excel academically in any one area you may be able to earn some extra cash from your knowledge with these ideas. Are you a native English speaker? Do you have a college degree? Even better, are you a teacher? If so, you can earn great money teaching English in your own home to foreign students online. You simply login at your given appointment, and teach! It's that easy. VIP Kid is a service that connects English speakers with those looking to learn. It can pay really well if you push yourself to teach often! Check out VIP Kid here. StudySoup is a site where students can buy other student’s notes, study guides, and even webinars. If you’ve been taking excellent notes and excel in any area academically you might want to try giving a shot at profiting from the work you’ve already done. These type of jobs are perfect for anyone who doesn’t want to feel tied down with a side job and wants a super flexible extra income schedule. Online surveys aren’t going to make you oodles of money. 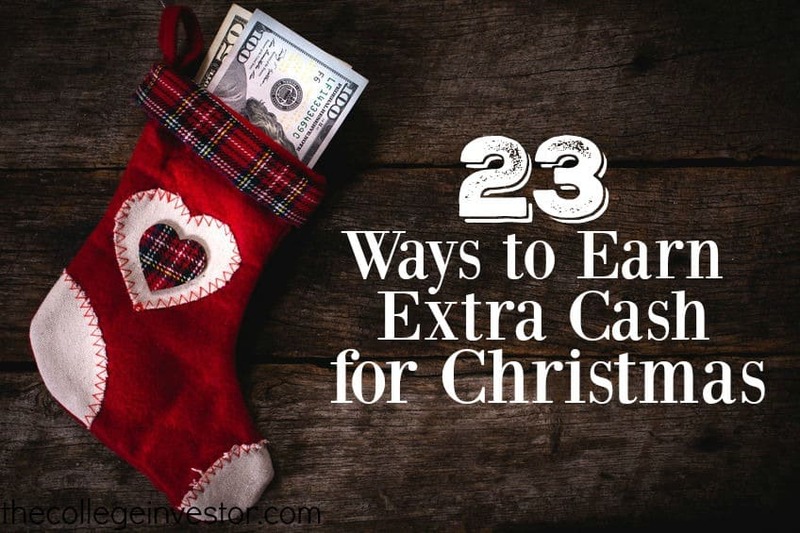 But if you’re looking for something that is really easy, flexible, and won’t eat up much of your time, you may be able to earn a little pocket cash before Christmas rolls around. Survey Junkie - One of the best online survey sites that pays for filling out surveys. Swagbucks - You can get a $5 signup bonus for signing up here. As a brand ambassador you can earn $15-$20 per hour by attending events on behalf of a company and passing out free items from the company. Melanie suggests to start your search by looking up “Brand Ambassadors (In Your City)” on Facebook. Fiverr is a site where you can offer almost any service you can think of starting at $5. No matter what your skillset there’s a chance someone on Fiverr will want what you offer. After you land a few clients and receive high ratings you can then start increasing the price of your service. Check out Fiverr here. Agent Anything is a site that outsources small tasks but is tailored to local students. You can find a wide variety of tasks to perform at varying pay rates. Mechanical Turk is a site set up by Amazon that allows users to perform “HITs” which are small micro tasks. While each task might not pay a lot many take only minutes to do. Here’s a list of HITS worth looking at. You can read our full guide to making money on Amazon Mechanical Turk here. Did you know that companies will pay you to test their website for usability? You can sign up with a place like UserTesting.com and earn up to $10 for each website you test. Most tests take less than a half an hour to do. You can contact the psychology department of your school to see if there are any medical studies you can participate in. This could earn you anywhere from hundreds to thousands. One of our friends did this for an experimental cast. He had to get his leg casted and wear the cast for a week. He was paid well over $1,000 for his time! Two sites that I’ve uses for years to earn extra cash for Christmas are Swagbucks and Inbox Dollars. Both of these sites will award you points for searching the internet, filling out surveys, playing games and more. Inbox Dollars also has a feature where you can “read” emails for money. While neither of these sites will make you rich I easily earn a couple hundred from each throughout the year with very minimal effort. If you like to drive and have spare time these side jobs will suit you! If you live in a city where on-demand ride shares are popular and you have a car you can drive for Uber in your spare time. We recently read how Sam from Financial Samurai was able to make $100/hour with Uber. And Harry at the Rideshare Guy regularly averages over $18/hour. Plus, a lot of these sites offer cool bonuses! Drive For Uber: Uber is the biggest company for ridesharing, and they offer bonuses from time to time. Get started driving for Uber here. Drive For Lyft: Lyft is the #2 ridesharing company, but they are gaining ground. Right now, they are offering a $300 sign up bonus after you complete 100 rides. Sign up and get the bonus here. Deliver For UberEATs: If you're unsure about having people in your car, what about delivering food? Try out driving for UberEATs and just deliver food. Sign up for UberEATs here. Task Rabbit is a place where you can find small errands and tasks to do for others in your area. These tasks can be all sorts of things including taking someone to the grocery store or even helping someone moving. Postmates is a service will pay you up to $20 per hour to deliver food. You can check on their site to see if they need drivers in your area. Another similar company is DoorDash, which we just reviewed here. Also, in some cities, you may be able to become a driver for Amazon Flex. If you’re good at finding deals, have a source for wholesale products, or are crafty enough to make your own products here are some selling ideas to try. If you make homemade products like crafts, candles, clothes, soaps, or jewelry you can set up an Etsy store and make your handmade items. You will need to market your business to draw customers into your store, but Etsy is huge during the holiday season. Check out Etsy here and get started. At one point Robert was making around $3,000 per month selling on eBay as a side business. He scoured garage and estate sales and bought the items he thought would bring a profit. Every year, hot toys, consoles, and other things hit the store shelves. If you're savvy, you can spot these items, buy them early, and then resell them for huge profits on eBay as it gets closer to Christmas. Get started on eBay here. Amazon’s FBA service has become quite popular with side hustlers and small business owners. With Amazon FBA you can send in products directly to Amazon (for a small fee) Amazon will store your inventory, ship when it’s purchased, and handle returns on your behalf. You, of course, will need to find a source of profitable products to make this work. I tried my hand at Amazon FBA this year and almost everything I sent in sold within a month. Freelance income is my favorite source of active income. As a freelancer you can turn your skills into a very profitable side business. There are a ton of ways to earn money by writing. And the good thing is that once you find yourself some clients the income is pretty immediate. Here are 14 ideas to make money by writing. If you want to do this full time (or a big time side hustle), consider taking this class on how to get paid to write. Virtual assistants do things like setting up appointments, editing blog posts, posting on social media and more. If you’re skilled in several areas and want a flexible side job that you can do from home, start contacting businesses who may need your help and pitch your services. You can also set up a profile on a place like UpWork, just don’t take less money than you’re worth. Two areas that are booming right now for virtual assistants are proofreading and transcription services. Many bloggers and authors leverage proofreaders to check their grammar and more. You can learn how to be a proofreader and find jobs here. If you're a fan of podcasts, you've likely heard the term "show notes". Well, these are basically a transcription of the podcast. With the rise of video and audio shows, transcription services are at an all time high. Learn how to transcribe and get jobs here. Tried and true, babysitting and housesitting are known ways to earn some extra income. During holiday breaks when kids are out of school babysitting is more in demand. Plus, many parents will have work holiday parties, or simply will need a break! Take advantage and earn some extra money. Don't know anyone local that you can do this for? Consider making an account on Care.com and seeing if you can get business that way. While you wouldn’t traditionally think that dog walking or dog sitting is a profitable side business endeavor, it really can be. Especially in the colder fall and winter months. Many dog owners are willing to pay to have their pooch walked on a daily basis. Just like babysitting, if you don't know any dog owners, you can still find clients online. Check out Care.com and see if you can find people to dog walk on there. Here’s an idea specific to Christmas – advertise a Christmas light hanging service on Facebook or Craigslist. Many busy and/or older people would love to decorate, but can't do it anymore. You can help them, and get paid for it! If you’re good at graphic design you have a skill that is in demand. To make good money from your skill you just need to make sure you’re marketing your services to the right people. If you have video editing skills put them to use and offer your services to those who need them. Video content is becoming increasingly popular on the internet and you could help everyone from small businesses to popular bloggers. Pick a market and pitch your services. There are millions of way to earn extra income. If you took any some of these ideas and spend a few hours per week on them you should be able to earn enough cash to cover your Christmas expenses this year. Also, remember, you can use a cashback credit card to earn extra cash on the gifts you'd normally be buying. I bring this up because some credit cards sweeten the deal right before the holiday season. Check out these top cashback credit cards to see if it makes sense. Do you actively earn extra cash for Christmas or save all year? I definitely need to look into Fivrr one of these days. It seems to be a good place to make some money if you’re efficient and good at what you are offering to do. Flashnotes changed their name to “Luvo” and then went out of business within this past year. RIP – I miss this because I made over $1,000 in one semester using them my freshman year of college! Bummer to hear they went out of business. It was a great concept.